We are hard working brewers, cooks, servers, bartenders, managers, and administrators and we believe beer should complement our lifestyle. We love balance in life. We also love celebrating! HARD WORK! BALANCE! CELEBRATION! These words define our company, our beer, and our future. 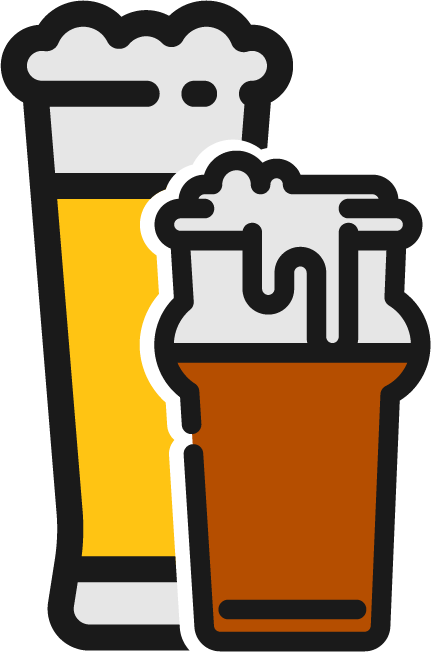 We brew a variety of beers that are popularized across the world though we specialize in English and American ales. There’s always something new to try in our taproom; we aim to educate your palate and expand your senses with our delicate and balanced ales and lagers. Light bodied black ale brewed with raw and brown malt. Light and refreshing ale brewed with corn and Michigan Yeast. Medium bodied French Saison brewed with candied Ginger. A rich, Scottish strong ale boasting flavors of toasted caramel, molasses and spice. Traditional English Brown Ale made with sweet and creamy coconut. Easy drinking red ale with a toasted body and light hops. A light Kolsch “mojito beer.” Peaches, lime juice and fresh mint! A welcomed change of pace! Black and rich, this Russian Imperial stout has flavors of coffee, dark fruit, and roast. Bitter, hoppy Red IPA Brewed with spicy Rye malt. Traditional German Wheat Ale, esters of clove. Light and refreshing! We roast 15#s of pecans for each 90 gallon batch. Dark, approachable, with a touch of sweetness. Our house IPA. Full bodied and showcasing Newaygo Chinook hops. Medium bodied stout beer with locally roasted coffee. Thanks Uncommon Coffee Roasters! Light Kolsch beer brewed with cereal. Aroma of cinnamon with a touch of maple sweetness. A rich, nordic porter with a touch of smoke and black licorice. Check out our specialty cask ales, available on select weekends. Naturally carbonated ales served from our UK beer engines at cellar temperature. ** Late Mugs are ordered every 2 weeks. IS THIS BEER JUST WARM AND FLAT? NO, BUT IT MAY NOT BE WHAT YOU’RE EXPECTING. Cask Ale is not just warm and flat. We think there is a descriptive language that is, well, more poetic. At Newaygo Brewing we like to say it’s served at cellar temps and naturally carbonated. Capice? Our rotating lineup of traditional casks ales present full-bodied and balanced with tall, thick heads. It’s a sublime drinking experience for the true connoisseur. We believe that any of our English Porters on cask represent the epitome of our beer brand. If you see Porter available on cask, order it. You must.